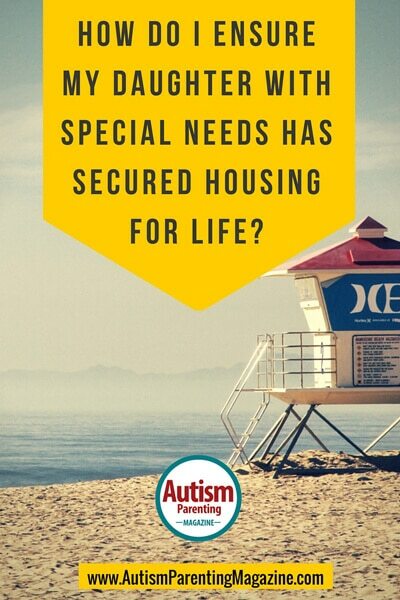 How Do I Ensure My Daughter with Special Needs Has Secured Housing For Life? Investigate organizations in your area that provide housing for individuals with autism and schedule a time to meet with them. Depending on your daughter’s abilities, there will likely be a number of options including Independent Living Apartments with supervision, Group Home, AFL (Alternative Family Living), and, depending on your family situation, some organizations will work with you on customizing a housing option for your daughter. Once you have determined the options in your area, now it is time to determine the financial cost to those options. It is very common that a majority of the cost will be covered by government benefits such as SSI (Supplemental Security Income) and Medicaid; however, those programs do not cover all the costs. It is important to understand the amount of money you will need to leave your daughter in order for her to have the life you want her to have when you are no longer here. Decide on how you will fund your daughter’s needs. It is important that you communicate your plans with extended family members and friends so that all people who are involved in your daughter’s life are informed. By doing this, you are ensuring that all people who care about your daughter are reading from the same page, and that your wishes for your daughter will be carried out appropriately. We do recommend that you find professionals to help you in creating your plan and in carrying it out. Due to the complexity of government benefits, taxes, and legal issues there are many pitfalls that you will want to avoid, and a qualified guide can help you do just that. Please visit our website to download our Complimentary Guidebook on Special Needs Planning, which also includes Interview Questions that you can use to find a qualified professional.